One of Britain's youngest private pilots has achieved a lifetime ambition of flying with one of the world's famous display teams. Beth Moran, from Sussex, took to the skies over Gloucestershire in the back of an American F-16 Fighting Falcon fighter jet as a special guest of the U.S. Air Force's Thunderbirds air demonstration team as the elite pilots geared up for this year's Royal International Air Tattoo at RAF Fairford. The 21-year-old experienced g-loads equivalent to nine times the force of gravity. 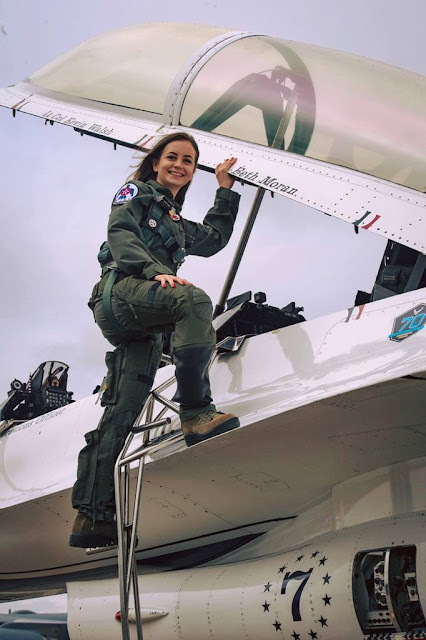 Later she took the controls of the fighter during a brief jaunt to North Wales, before returning to Fairford, where she was declared as the youngest female pilot to ever fly with the team. The team even painted Beth's name under the cockpit of the aircraft for the occasion. "It's quite surreal," said Beth as she stepped down from the aircraft. "The pilot said you can now add an hour of F-16 time to your logbook, but it went so quickly." Flying the fighter was a big step up for Beth who is more familiar with the rather more sedate Piper Warrior light aircraft in which she was taught to fly. As part of the experience flight Beth was taken through all the manoeuvres performed by the team during their demonstration, building up g-loads before pulling 9.2 g.
"It feels like a herd of elephants sitting on you," said Beth, "but you recover quickly." Beth's experience in learning to fly and the flight with the Thunderbirds is being documented by a film crew from Fact Not Fiction Films. She achieved her aim of getting per private pilots in December 2016, and is hoping that the documentary will encourage others to follow their dreams and learn to fly or develop an interest in aviation. 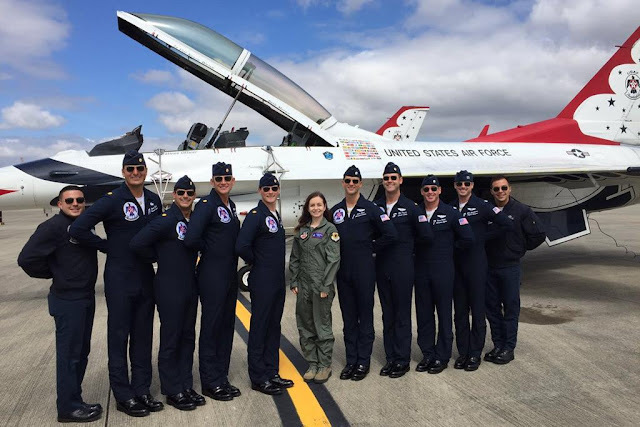 Lt. Col. Kevin Walsh, the Thunderbirds' Operations Officer said that Beth's aviation experience shone through as she took the controls for 10 minutes of the hour-long flight. "Her previous aviation experience showed when she took the stick," said Lt. Col. Walsh. The Thunderbirds are making their first appearance at the Royal International Air Tattoo in 10 years, their appearance marks the 70th anniversary of the United States Air Force and 100 years of American airmen in Europe. It's not the first time a civilian flies with Thunderbirds, sometimes the American aerobatic team takes on board guests during their performances. In April the 87-year-old astronaut Buzz Aldrin, the second human to walk on the moon, became the oldest person to ever fly with the USAF Thunderbirds.